In this work, performance of composite membranes was investigated for desalination of Kashan city’s water via pervaporation process. PEBA/PAN/PE, PEBA/PSF/PE and PEBA+NaX/PSF/PE composite membranes that used, was synthesized via a phase inversion route. For all experiments under 45◦C, salt rejection was too high and equals to 99.9% that this quantity dropped by increasing the temperature that cause membrane swelling in high temperatures. Water contact angle and water take-up were measured to evaluate the hydrophilicity of the membrane. Also the effect of operating conditions including feed temperature and permeate pressure on permeability and selectivity is discussed. A permeate flux of 4.93 kg/m2h with salt rejection of 99.9% could be achieved at a feed temperature of 50 °C and a vacuum of 0.04 bar. Apparent diffusion coefficients of water at various permeate pressure and feed temperature are calculated. The most effective parameter was feed temperature. In the past few decades, water scarcity has become one of the most serious challenges globally in the society. Over 2.3 billion people on the Earth live in the water-stressed areas, and this number is expected to increase to 3.5 billion by 2025 . In order to maintain the sustainable development of economy and environment, Global Water Partnership (GWP) was established in 1996 to develop Integrated Water Resources Management, focusing on the adjustment, management and development of water, land and related resources . Technologies for water desalination have been developed in two approaches: one is based on distillation, including multi-stage flash distillation and multiple-effect distillation; the other is membrane-based desalination, including nanofiltration, vacuum membrane distillation and reverse osmosis . In recent years, membrane separation processes become more and more popular in desalination because the energy requirements are lower than that of the traditional distillation processes. As a result, Membrane processes are environmental friendly since the membranes are made of relatively simple and non-harmful materials. A large number of polymers can be used to prepare membranes. In general, a high salt rejection and permeation flux are required for desalination with membrane processes. Until now, RO has been one of the most important membrane processes for desalination in industrial scale . However, the wide spread use of RO process is restricted by some operating conditions, high energy cost and easy fouling [6,7]. To deal with high-salinity water, an extremely high operating pressure is needed in RO process. Comparing with the membrane distillation, pervaporation desalination using hydrophilic materials can effectively reduce membrane fouling and maintain membrane separation performance. Currentefforts are focusing on pervaporation with the hope touse this technology for sea water desalination in the future [8,9]. The composite membranes used in this study were made of poly(ether block amide) (Pebax-1657) which is a hydrophilic polymer and have been shown in Fig. 1. Pebax is copolymer with soft and flexible segments, which make it useful in many areas, including medical, textile and membrane applications. The Pebax® polymer used in this work had high sorption of water vapor . However, very little research is done related to Pebax for desalination applications. 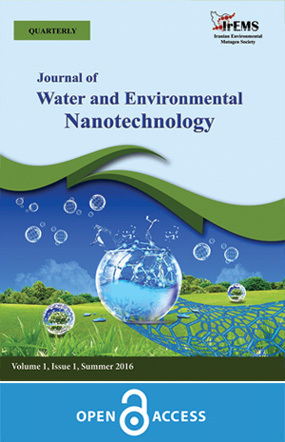 Therefore, the performance of PEBA-based nanocomposite membranes for desalination of high-salinity water was studied in this work. The PEBA/PAN/PE, PEBA/PSF/PE and PEBA+NaX/PSF/PE composite membranes was synthesized via n phase inversion route. The porous PAN and PSF substrate was prepared by spin coating method. Solution of PAN or PSF was casted by the spin coating method on the PE and immediately submerged into a de-ionized water bath as non-solvent at 40°C. Finally, the prepared membrane was dried at room temperature. Then, Polymer solution containing 8% PEBA granules or PEBA+NaX and 92% de-ionized water and ethanol (30/70) was prepared by stirring for 8 h. the prepared solution was casted on prepared porous PAN or PSF substrate in the last process and then put in oven at 50 °C for 48 h to evaporating of solvents. Pebax-1657 was chosen to enable greater interaction with H2O molecules through H-bonding as this grade of the polymer contains 40% amide groups. Chemical structure of PEBAX-1657 was shown in Fig.1. Pebax-1657 was purchased from Arkema, France. Reagent grade chemicals Polyacrylonitrile (PAN), polyester (PE), Polysulfone (PSF) and NaX were obtained from Sigma-Aldrich and used without further purification. The pervaporation experiments were carried out at variable temperature (from 25 to 29 °C) on a laboratory scale pervaporation unit as shown in Fig. 2. The membrane was placed in the middle of a pervaporation cell with an effective surface area of the membrane of 21.237 cm2. During the experiment, the feed solution was preheated in a water bath to a desired temperature and pumped to the pervaporation cell using a pump. Where Di is diffusion coefficient (m2/s), J is the permeate flux, is the membrane thickness, and Ci,f is the concentration of component i in the feed. Composite membrane was investigated by scanning electron microscopy (SEM) (VEGA \\TSCAN-LMU). SEM images of the membranes reported the cross-sectional and surface morphologies of the prepared composite membrane. Where Ws and Wd are the weight of wet and dry membrane layers, respectively . The hydrophilic properties of membrane samples were assessed by capturing of water droplet. Static contact angles were measured by the sessile drop method. A 6 μL water drop was formed on the levelled surface of the membrane for contact angle measurements. Samples were fully dried before testing and five different locations of each sample were selected for testing. SEM images of surface and cross-section of the composite membrane are reported in Fig 4. Fig. 4 (a) exhibits the surface of the PEBA1 composite membrane manufactured from pure PEBA 1657 which is dense, homogeneous, defect free, without any leak, and suitable for gas separation. Fig. 4 (b,c) represents the cross-section of the composite membrane indicating a PAN ultra-porous substrate with thickness of about 21 μm without any defect or split formed on PE non-woven paper layer. Also a PEBA dense layer with thickness of about 11 μm shaped on PAN substrate. Each experiment was run for 4 h. At the end of each experiment, the downstream (permeate side) of the membrane cell was flushed with a known amount of de-ionized water and the conductivity of this stream was measured to check the salt leaking. In the study, hybrid membranes remained cleanand there was no evidence of salt precipitation onthe permeate side of the membrane. The results during pervaporation testing were reproducible, with the variation generally within±0.2 kg/m2 h for water flux and ±1.0% for salt rejection. Fig. 5 shows the pervaporation desalination performance of PEBA hybrid membranes with same thickness at a feed temperature of 40 ◦C and a vacuum of 0.04 bar. All prepared membranes had the same amount of PAN (40 wt% with respect to PEBA. Overall, the PEBA based hybrid membranes demonstrated good desalination performance with high flux (>3 kg/m2 h) while maintaining a high salt rejection (>93%). The salt rejection increased with the filler content and achieved >99%. The salt rejection increased with the filler content and achieved >99%. The incorporation of NaX nanoparticles in the polymer chain may disrupt the polymer chain packing and therefore lead to reduced free volume radius and consequently a high salt rejection . Fig. 6 shows the effect of salt concentration in the feed solution on separation performance of aqueous salt solution at various feed temperatures. At room temperature, salt concentration has negligible effect on water flux. At a higher temperatures (50 °C), the water flux decreases with increasing salt concentration. This increase became more significant as the feed temperature was increased further to 60 °C. Feed concentration is believed to directly affect the sorption of its components at the liquid/membrane interface . That is, the concentration of the components in the membrane tends to increase with its increase in the feed concentration. Since diffusion in the membrane is concentration dependent, the permeate flux generally increases with the bulk feed concentration . As the salt concentration increased from 0.076 to 3.5 wt%, the water concentration decreased from 99.924 to 96.5 wt%. At room temperature, this decrease in water concentration may not have any effect on diffusion within the membrane as the majority of the feed is water and there is no major difference of water vapor pressure at salt concentration range of 96.5–99.924%. It is therefore expected that the diffusivity of the membrane towards water remained constant at room temperature. Therefore, there was no or negligible change on the flux. On the otherhand, at the higher temperatures, as the vapor pressure is exponentially related to the temperature, differences in bulk feed water concentration would have pronounced effect on the water concentration in the membrane surface, and consequently affect the diffusivity and flux. Therefore, it is expected that, at the higher temperature, that increasing salt concentration would lead to adecrease in diffusivity in the membrane due to the decreased water concentration. Fig. 7 shows the effect of feed temperature on the pervaporation desalination performance of hybrid PEBA composite membranes at a vacuum 0.04 bar. For all feed concentrations, there was an exponential increase of water flux when the feed temperature increased from 30 to 60 °C. A high water flux of 7.63 kg/m2 h was achieved at the feed temperature of 60 °C. This is not surprising, as firstly, the driving force for the pervaporation process is the partial vapor pressure difference of permeant between the feed and permeate conditions. As the feed temperature increased, the water vapor pressure on the feed side increased exponentially. As the vapor pressure on the permeate side was held constant, the increasing vapor pressure in feed led to an increase in the driving force and consequently the water flux. Secondly, an increase in temperature also raises the diffusion coefficient for transport through the membrane, making it easier for the transport of the water molecules. This is confirmed by the diffusion coefficient results as shown in Table 2. As can be seen, there is an increasing trend in the diffusivity coefficient of water in the hybrid membrane as the feed temperature rose. In addition, the mobility of the polymer chains also increased with the feed temperature, which led to the increase of the free volume of the membranes. According to the free volume theory , the thermal motion of polymer chains in the amorphous region creates momentary free volumes. As the temperature increases, the frequency and amplitude of the chain motion increase and the resulting free volumes become larger. Consequently, water molecules which have smaller size can diffuse through these free volumes more easily. Therefore, the water flux increases. Permeate pressure is another important operating parameter as a high vacuum is directly related to a high energy cost. Theoretically, the maximum flux is achieved at zero absolute permeate pressure.Fig. 8 shows the effect of permeate pressure on water flux. Generally, the water flux decreased as the permeate pressure is increased since there is a decrease of driving force for mass transport. For pervaporation processes, the driving force is provided by the vapor pressure difference between the feed and permeate side of the membrane. With increasing permeate pressure (i.e. decreasing vacuum), as the feed side pressure remains unchanged, the transmembrane vapor pressure difference is increased. This leads to a decreased driving force and consequently water flux. It was observed that the water flux dropped down to less than 0.5 kg/m2 h when the permeate pressure increased to 0.07 bar. At temperature 40 °C, the saturation vapor pressure of water is about 0.073 bar . When the permeate pressure is increased 0.07 bar, the driving force for water vaporization approaches zero, leading to near zero net evaporation and consequently the low mass transport of water. Table 3 presents the diffusion coefficient of water at various permeate pressure. Decreasing diffusion coefficient with permeate pressure indicates that the permeation process is mainly controlled by diffusion through the hybrid membrane. As permeate pressure increased above 0.07 bar, the diffusion coefficient dropped significantly, by nearly90%, indicating the diffusion of water has been greatly reduced. Pervaporation under various operating conditions was carried out to evaluate the separation performance of aqueous salt solution through the hybrid PEBA membranes. Membrane PEBA1 showed the best performance leading to interesting fluxes and salt rejection values for feed salt concentrations of 0.076 and 3.5 wt%. A high water flux of 4.93 kg/m2h could be achieved for PEBA1 composite membrane at a feed temperature of 50 °C and a vacuum of 0.04 bar, while for PEBA2 and PEBA2X this quantity were 1.24 and 1.3 kg/m2h, respectively. Under all operating conditions, salt rejection remained high (up to 99.9%), indicating salt rejection performance of hybrid PEBA membranes is independent of the operating conditions due to the non-volatile nature of NaCl. High feed temperature and high vacuum had a significant enhancing effect on the water flux and diffusivity coefficients of water due to the increased driving force and increased free volume of the membrane. The effect of feed concentration had differing impacts depending on the operating temperature. At low feed temperatures, the salt concentration in the feed solution had little or negligible effect on water flux and diffusion coefficients. However, at high feed temperature (50–60 °C), feed flux and diffusivity of water decreased with increasing salt concentration due to the decreased water vapor pressure and consequently water concentration in the membrane surface. The authors would like to acknowledge the Mr. Azadikhah for the financial support of this work. 1. Elimelech M, Phillip WA. The Future of Seawater Desalination: Energy, Technology, and the Environment. Science. 2011;333(6043):712-7. 2. Rogers P, Bhatia R, Huber A. Water as a social and economic good: How to put the principle into practice: Global Water Partnership/Swedish International Development Cooperation Agency Stockholm, Sweden; 1998. 3. Wang LK, Chen JP, Hung Y-T, Shammas NK. Membrane and desalination technologies: Humana Press; 2010. 4. Cath TY, Childress AE, Elimelech M. Forward osmosis: Principles, applications, and recent developments. Journal of Membrane Science. 2006;281(1–2):70-87. 5. Kwak SY, Kim SH, Kim SS. Hybrid organic/inorganic reverse osmosis (RO) membrane for bactericidal anti-fouling. 1. Preparation and characterization of TiO2 nanoparticle self-assembled aromatic polyamide thin-film-composite (TFC) membrane. Environ Sci Technol. 2001;35(11):2388-94. 6. Chen KL, Song L, Ong SL, Ng WJ. The development of membrane fouling in full-scale RO processes. Journal of Membrane Science. 2004;232(1–2):63-72. 7. Kuznetsov YP, Kruchinina EV, Baklagina YG, Khripunov AK, Tulupova OA. Deep desalination of water by evaporation through polymeric membranes. Russian Journal of Applied Chemistry. 2007;80(5):790-8. 8. Xie Z, Ng D, Hoang M, Duong T, Gray S. Separation of aqueous salt solution by pervaporation through hybrid organic–inorganic membrane: Effect of operating conditions. Desalination. 2011;273(1):220-5. 9. Hamouda SB, Boubakri A, Nguyen QT, Amor MB. PEBAX membranes for water desalination by pervaporation process. High Performance Polymers. 2011;23(2):170-3. 10. Villaluenga JPG, Godino P, Khayet M, Seoane B, Mengual JI. Pervaporation of Alcohols and Methyl tert-Butyl Ether through a Dense Poly(2,6-dimethyl-1,4-phenylene oxide) Membrane. Industrial & Engineering Chemistry Research. 2004;43(10):2548-55. 11. Wang Q, Lu Y, Li N. Preparation, characterization and performance of sulfonated poly(styrene-ethylene/butylene-styrene) block copolymer membranes for water desalination by pervaporation. Desalination. 2016;390:33-46. 12. Xie Z, Hoang M, Ng D, Doherty C, Hill A, Gray S. Effect of heat treatment on pervaporation separation of aqueous salt solution using hybrid PVA/MA/TEOS membrane. Separation and Purification Technology. 2014;127:10-7. 13. Jiraratananon R, Chanachai A, Huang RYM, Uttapap D. Pervaporation dehydration of ethanol–water mixtures with chitosan/hydroxyethylcellulose (CS/HEC) composite membranes: I. Effect of operating conditions. Journal of Membrane Science. 2002;195(2):143-51. 14. Wang Q, Li N, Bolto B, Hoang M, Xie Z. Desalination by pervaporation: A review. Desalination. 2016;387:46-60. 15. Burshe MC, Sawant SB, Joshi JB, Pangarkar VG. Sorption and permeation of binary water-alcohol systems through PVA membranes crosslinked with multifunctional crosslinking agents. Separation and Purification Technology. 1997;12(2):145-56. 16. Shakhashiri BZ. Chemical demonstrations: A handbook for teachers of chemistry: Univ of Wisconsin Press; 1985.